Tinuku ~ Campana brothers using coster to Aesop store in São Paulo. 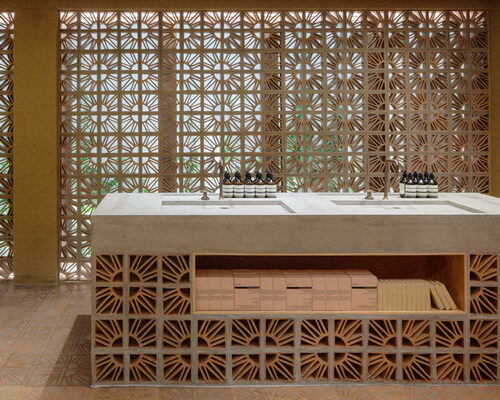 Fernando and Humberto Campana using hollow terracotta bricks Cobogó Brazil for facade and interior furniture store. 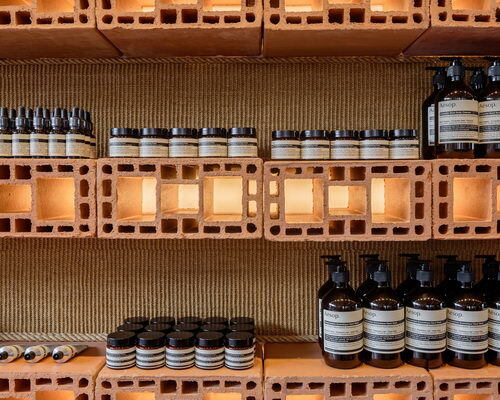 Following footsteps of Paulo Mendes da Rocha, Vincent Van Duysen and Ilse Crawford, Campana studios deliver latest designs to create Aesop store interior using Brazil traditional brick cobogó. Loster hollow ceramic type commonly used in South America allows ventilation and lighting evenly into building. Hollow brick into plain wall store, provides rack furniture and create inset poured onto concrete floor to exterior. 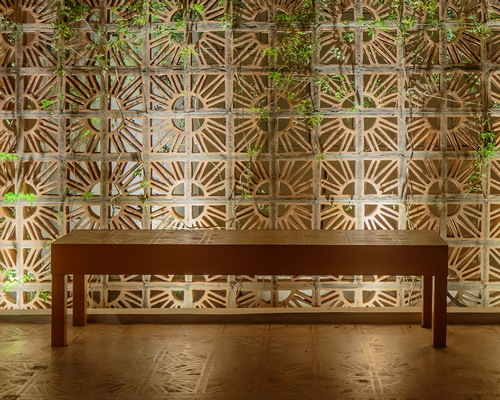 "We developed special floor made of cobogó brick filled with concrete, an entirely experimental work gave rise beautiful patterns," said Humberto. Terracotta blocks have grid quarter circle structure in one corner with lines radiating out, so when four units grouped together creating sun motif. 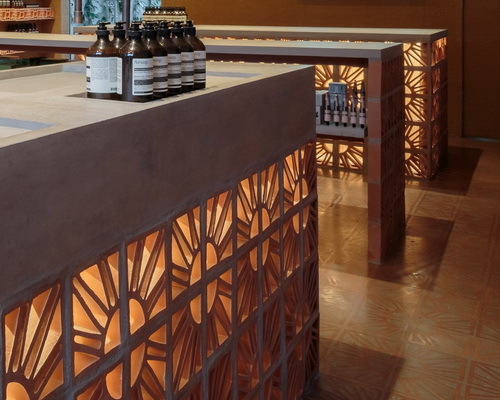 Campanas use concrete for countertops and sink where customers can test the product. Sisal fiber textile plant applied as background rack terracotta. The front page implementing wooden benches and vines. "Sisal fibers as natural background complements powerful graphics effects. We covered walls with this fiber as acoustic element to bring zen atmosphere," said Humberto. A decorative gate stands in front of brick using cobogó and aluminum. Jasmine fragrance component life is native to accentuate earthy color palette, offer contrasting colors natural and unique aroma. 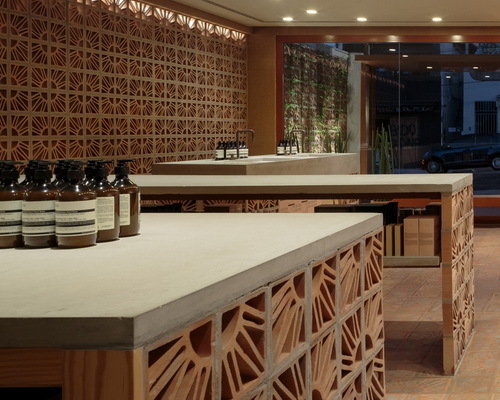 Aesop has built reputation in aesthetic is unique to each store worldwide. Interior in Vila Madalena neighborhood combines art, friendly and warm to customers. Exterior benches offer people passing by to rest. 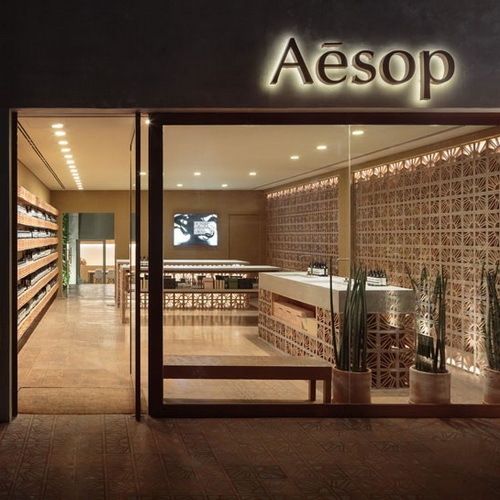 "The result is space exceeds commercial functions and offers meeting place for local community," said Aesop.